The staff of tattoo artists at Monique’s can help you find and develop a tattoo that is one of a kind, "so it’s not just like everything else you see". It is yours and it is unique. They have over 10 years’ experience in this industry and the artistic talent to meet your expectations. We have five artists with their own style and individuality for you to sit down with and build your ideas. Located to the left side are links to each of their portfolios. 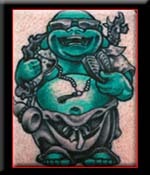 These are pictures of tattoo's that have already been done on their clients. These are just small samples of their work. If you have further questions about your design idea's, whether it is big or small, please feel free to stop in and see them.